New construction or renovation, what is the difference when selecting a shower drain? When renovating a bathroom, you’re installing the shower drain in the existing floor. 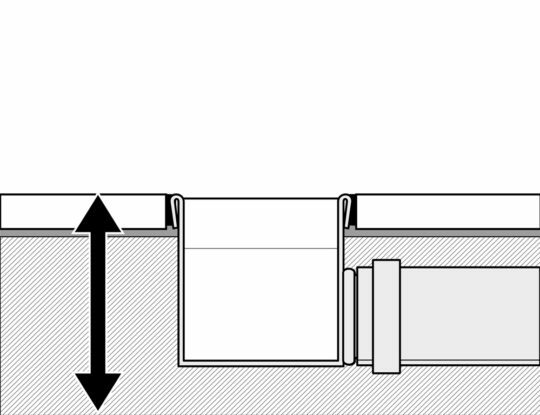 Sometimes there isn’t a lot of space in the floor/substrate to install the drain, so the installation depth of the drain is an important factor. Choose a shower drain with low installation depth when there’s little space available. The Easy Drain Compact, the world’s flattest shower drain with 50 mm water seal (European building standard EN 1253) has a total installation depth of just 63 mm and is therefore perfect for virtually any renovation project. Also, the Easy Drain M-line has a flat design that is perfect for renovation projects. In new construction projects, the installation depth is normally not an issue. You can select any drain that matches your preference.